It’s time to start getting ready for the spring semester, so I spent a good chunk of the morning and early afternoon on campus. 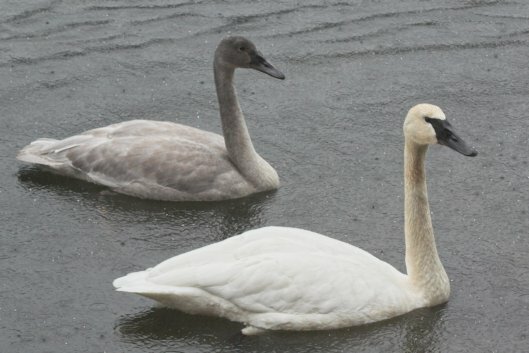 I was able to get a ride out to Starrigavan to look at the 8 Trumpeter Swans that have been hanging out there lately. After that we stopped by Marge and Tedin’s house so I could show them some of the things I have been doing with their bird sighting records and get the original data cards from them. Tonight I had a basketball game at 9pm, so I rode my bike out to the middle school for it. Weather: It was mostly calm today, though there were periodic showers. It started snowing this evening. The clouds were thin enough tonight that I could see the mountains dimly, though I could not see the full moon that was the reason for their illumination. Birds: In addition to the swans at Starrigavan, there were quite a few Mallards in the estuary. I was told that there were shore birds on Sage Rock again today, though I did not go down and see them myself. Other Notes: Yesterday and today there have been 11.64 foot high tides. It looked like the tide had been high enough to cover the edge of the Nelson Logging Road. That’s not quite as high as it was when the road was under 9 inches or so of water during a 12.8 foot high tide in late December 2003.